Depending on the time of year and plants surrounding your pool, you will find it necessary to remove dirt and debris that have fallen or blown into your pool. You should remove dirt and debris by skimming the surface with a net, collecting material for removal and by utilizing an automatic pool cleaner that vacuums the bottom of the pool to remove sunken debris. By doing this, you will make your pool look cleaner but also improve the performance of the chemicals and equipment in your pool. Cleaning out your pool filter and checking pump pressure are two of the best practices to add to your pool routine. 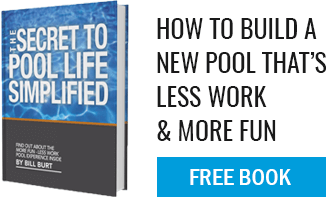 Neglecting your pool pump and filter can create costly issues. Each week, be sure to check if your pressure reads at 5-10lbs above the starting pressure according to your product manual, if so, then it’s time to clean out the filter. This can be done by removing and cleaning the filter cartridge or other types of filters need to be backwashed in order to relieve the pressure. Regular filter maintenance will prevent clogged filters, which can stop circulation of your pool water and therefore make a messy and dirty pool. Most pools are sanitized with chlorine although there are growing alternative sanitizers on the market. Sanitizing your pool disinfects your water to control germs, microorganisms, algae, and organic matter that can interferes with your pool’s chemicals. By sanitizing your water, you add chemicals that render the organic matter that wants to grow in your pool, unable to do so. Shocking is a treatment that replenishes the amount of free chlorine in your pool and it is recommended to shock your pool once a week. This can be achieved by using slow dissolving tablets that slowly release concentrated chlorine or through a non-chlorine method that uses potassium monopersulphate. In either case, swimming is not recommended directly after shocking as the chemicals can be harsh on your skin. It’s best to shock your pool and allow the pool pump and filter to run overnight to return to proper safe levels the next morning. It is recommended to test your pool water 1-2 times a week in order to keep your water at its optimal balanced levels. Take your water to your local pool supply store and they will happily test your water for you!